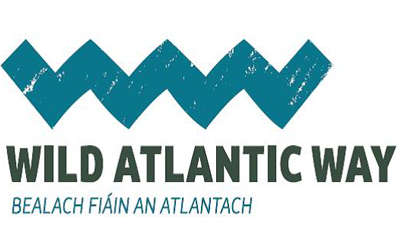 For those of you interested in such things, Ireland has a new tourist trail that you'll be hearing quite a bit about: The Wild Atlantic Way. Invariably dreamed up by some marketing mandarin in the sacred halls of the Irish Tourist Board, this immense trail - the longest in Ireland - is definitely worth talking about. Why? Because it offers some of the most scenic tours in the country and is well worth considering. This 'Road Odyssey' was launched to great fanfare by the government who takes much pleasure in such pronouncements. The 2,500 km (approx 1500 mile) journey stretches from Donegal's Malin Head, along the entire West Coast of Ireland, finally ending at Mizen Head in County Cork. It is not only the longest single tourist route in Ireland, but also the country's first long distance driving route. The idea, of course, is to plant the Wild Atlantic Way into the minds of potential global tourists, hoping to replicate the same reverence as Route 66 and the Pacific Coast Highway in the United States. Each segment offers geographies, micro-environments, and vistas that are unique. The great hope, of course, is that tourists will flock to visit one segment then come back to complete the entire Odyssey. Failte Ireland has done a great job of trumpeting this new journey and a wide range of websites are available that describe each segment. http://www.ireland.com/en-gb/wild-atlantic-way goes into great detail regarding each drive and provides online methods to book; http://www.activeme.ie/guides/driving/wild-atlantic-way-scenic-drive-west-of-ireland/ offers detailed maps of each segment together with points of interest; a February 2014 article in the Irish Independent (http://www.independent.ie/irish-news/10m-wild-atlantic-way-driving-route-launched-30047238.html) goes out of its way to report that the Irish government is spending up to €10 million to support and promote the spectacular drive. And while I have not driven all of it, what Ireland is promoting is not mere propaganda. For I've found that the West Coast of Ireland offers some of the most spectacular scenery in the world and the Wild Atlantic Way is a method of promoting it as a whole. Over the years I've had opportunities to visit Donegal and its amazing beaches whose azure waters would not be out of place in the Caribbean; Galway, with Connemara, its splendid scenery, and quick side trips to the Aran Islands; Clare and yes, Limerick, and the unique ecosystems that the area has to offer; and Cork - did I mention that I live in County Cork? - offering scenery and coastlines that I believe are unrivaled anywhere. If you're planning a trip to Ireland, perhaps have a look at what The Wild Atlantic Way has to offer. No matter which segment you choose I'm certain that it will offer memories that you will long cherish.